Ozone is the main ingredient in smog. It’s heightened in hot summer months, leading to more asthma attacks and other respiratory issues. Most cities and towns will issue “ozone alerts,” on these days, warning people not to go outside or to limit their outdoor activities. The 2008 standard for ozone was 75 parts per billion, but former EPA head Gina McCarthy lowered it to 70 two years ago. Pruitt’s letter also stated that he wants the agency to assess that ozone threshold again by taking ozone sources from other countries into account. According to the American Lung Association, 125 million people live in counties where monitors show unhealthy levels of ozone or particle pollution. Decades of research show the negative health effects caused by vehicles, power plants, chemical plants, and other sources of smog. Environmental groups say the ozone threshold should be 60 or 65 parts per billion. 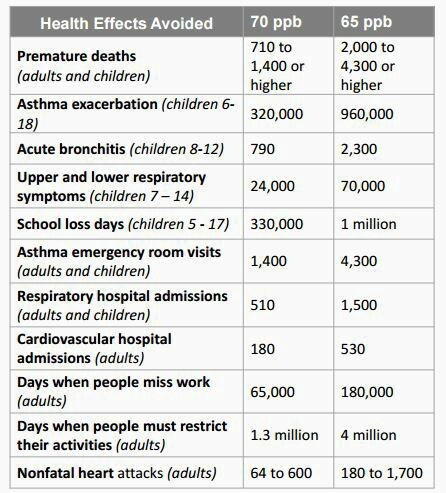 According to EPA data, even just a five-point reduction could significantly decrease the number of premature deaths and other health issues. Research shows that the Southeast can expect extreme heat and higher ozone pollution in urban areas because of climate change. Populated cities are already dealing with “heat islands,” which cause cities to be several degrees warmer than rural areas. Louisville, for instance, is one of the worst: it is 10 degrees hotter in some areas because of urban heating. Taking measures like planting trees and installing green roofing (roofs with living vegetation) or cool roofing (designed to absorb less heat and reflect more sunlight) can help mitigate that, in part. Still, excessive summer heat, which is starting earlier in the season and lasting longer, will likely lead to more air quality problems. In May, record heat was reported from Miami to Maine. Air quality alerts in the Deep South and Florida aren’t abnormal for that time of year, but it was relatively early for Tennessee and Kentucky to experience such high ozone levels. In 2016, these high levels, exacerbated by extreme heat and wildfire smoke from the increasing numbers of fires across the region, continued late into the fall. Just a week after President Trump said the U.S. will withdraw from the Paris climate agreement, Pruitt is signaling he may loosen ozone rules or let states decide how they want to regulate. It’s a small victory for the fossil fuel industry and industry-friendly politicians, who sued over the rule saying it would cost more than $1 trillion, and questioned the health benefits of it. Announced as the summer begins and the days heat up, the stay on the ozone rule slid through Washington and through the news cycle; it has yet to be reported on thoroughly. It’s the latest instance of Pruitt and the Trump administration halting Obama-era environmental regulations (the methane rule was paused last month). Lawsuits are challenging most of these, and dozens of cities and states have vowed to move forward with clean energy. But all too often, environmental groups frame issues like pollution around climate science and policy instead of health. Addressing health is also complex, but everyone values clean air. It stands to reason that to help close information gaps, cities, governments, and activists could more clearly break down the increasing health effects of global warming on rural and urban communities. In North Carolina, many blue-collar solar installers voted for Trump. But since he withdrew from the Paris agreement, they’re getting worried about their job security, reports The Washington Post. Bitter Southerner has a candid interview with S-Town’s Brian Reed on confronting Southern stereotypes. If you loved the podcast, it provides context and updates to the story. University of Georgia researchers will spend 12 days in the Gulf of Mexico researching the impact of the Deepwater Horizon oil spill. They’ll focus on how oil, methane and other chemicals affect deep sea ecosystems. In Asheville, North Carolina, the combination of climate change, aging infrastructure, and rapid development are causing major stormwater problems. After the Fukushima disaster, the U.S. Nuclear Regulatory Commission ordered a reassessment of regulations of storage facilities for radioactive spent fuel from nuclear power plants, but studies show the analysis was flawed. North Carolina and Alabama are two of five states with the most spent nuclear fuel stored in wet pools underground. Gulf Coast states are worried after Trump picked Jeffrey Bossert Clark to be the Justice Department’s top environmental lawyer. He was the lawyer for BP after the Deepwater Horizon oil spill.